Mango season is just a week away. Iam waiting for the Ripe Sweet Yellow Mangoes. Here is a small Manga Tale..
Small Raw Mango, called as Vadumanga in Tamil, along with its Senior Raw Mango, with a back shot of where they came from. Picturised from our terrace. Small Mango : Senior, see my friends in our Tree are asking us to come back. Shall we go? 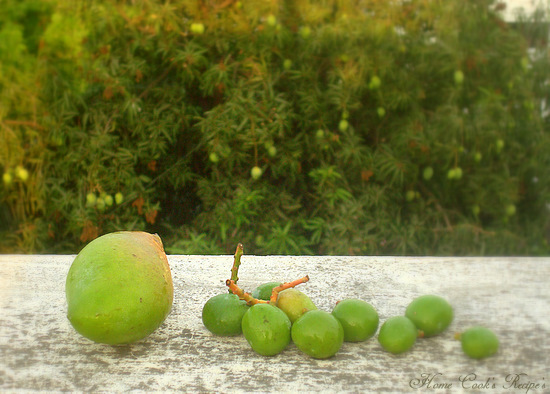 Senior Mango : No Dear..one day they will come here to join us. till then we shall wait here. Do you feel any other conversation apart from this? Now this small tale telling picture has to go for Click Spring/Autumn hosted by Bee and Jai. I got this recipe from Here. These Deep Fried Tofu are called as "Tofu no Otoshiage". the recipe call's for some Fish. but i tried it with Tofu and Leek, which is called as Negi in Japan. Mix all the ingredients togeather. Add beaten egg a little, so that you can shape the Tofu in a ball shape. shape the tofu's like ball's. Heat the oil in a pan, and deep fry them in slow flame. now the crispy, tasty, instant japanese starter is ready in a jiffy. add gram flour, green chilli's and little chilli powder to the crumbled tofu, wrap them up with bread crumbs and fry till they turn golden colour in slow flame. 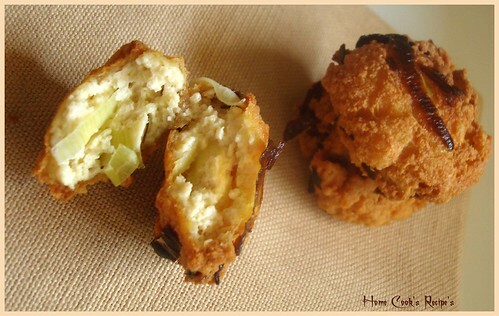 I really loved these sinfull deep fried tofu ball's. it was crispy in outer and spongy inside. 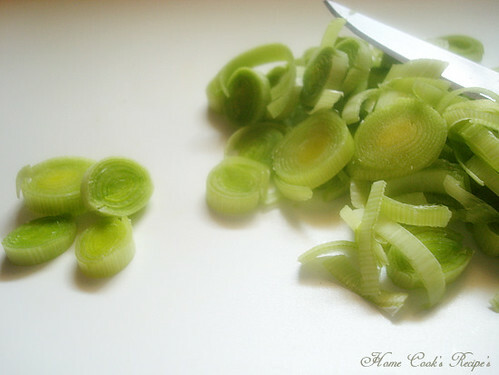 Leek certainly added a difference. Now this is my entry for A.W.E.D - Japan. event started my DK. 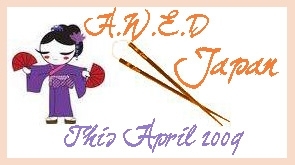 The Deadline for A.W.E.D - Japan is nearing, its just 5 days away. so keep rushing your entrie's. I have slowly started to buy and cook Mushroom's. This is the second time, i cooked with Mushroom, and its again the same Mushroom Curry. More than me, My hubby loved it. I did'nt have any idea, of how to prepare it, but some how i framed the recipe, while i cleaned the mushroom's and its here. I would say, this is a very simple recipe, even a beginner can try this . and keep aside. do not make them into paste, by adding water. the taste differ's. 2. Wash the Mushroom's and Let them dry. You can also wipe them with a clean cloth. 3. Chop the Onion's and Tomatoe's finely. 5. Add Onion's and fry them. add tomatoe's and fry along with onion's. onion, Tomato mix and mix them well. the masala. Garnish with Corriander Leaves. It was so Spicy, with the spiciness of Red Chilli, Green Chilli and Pepper Powder. for me it was like a pickle. 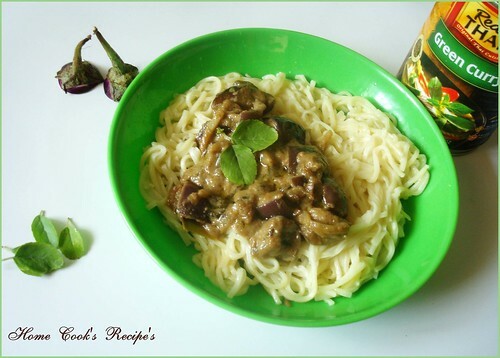 Try this, iam sure Spice Lover's will have no regret in trying it. 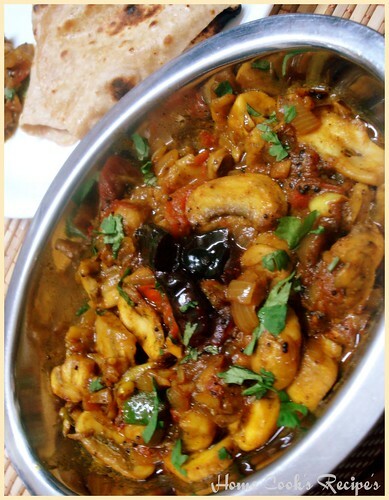 Now these Spicy Chettinaad Mushroom Masala moves to my RCI - Pondicherry Cuisine. Yes you can send me even Chettinaad Special's. 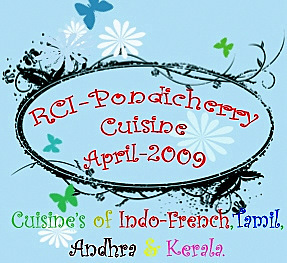 Tamil, Andhra, Kerala and Indo-French Recipe's. The above all come under this wonderfull RCI-Pondicherry Cuisine. It's Very Hot Here at Chennai, I could'nt even stand and cook more than 10 minute's in my kitchen, It's so Hot. I have simplified our meal's, and its getting done early in the morning to avoid the heat. Curd Rice is divine these day's and thank God, my husband never complain's even i serve him only curd rice and some fruit salad. I know, Blog World is caught up with Thai Fever spread by Priya, iam no where a standalone. Also My friend's please have some Japan Fever and Pondicherry Fever, Iam sure, you will enjoy cooking for all the event's lined up this month. 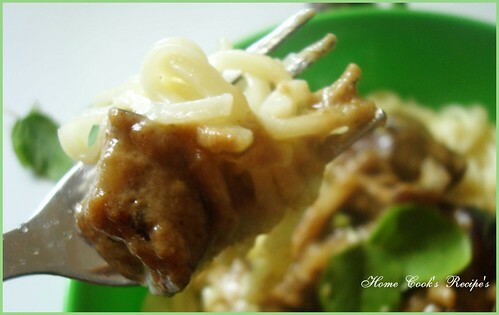 Thai Eggplant Curry on Noodle's, tasted so Good, that i must say, iam greatly attracted to the Thai Cuisine. I have even found a Thai Restaurant nearby, have to plan a visit there. Prepare the Noodle's as per the packet instruction's and keep it aside. In a Pan, have the Thai Green Curry and Eggplant's. Let it Boil and reduce the flame and cover the pan with a lid, so that the eggplant's get cooked fast. It get's cooked in 5-7 minute's. Add Basil to garnish and serve on Noodle's. you can also mix the curry with the noodle's, for a uniform taste. isnt the recipe so simple. You can also add other vegetable's, like capsicum/Bell pepper's, Baby Corn, Tofu, Carrot etc. It's the Goodness of coconut milk, that enhanced the taste of the curry. the spice level was very much like our's. and additionally a sweet and sour taste really highlighted up the curry. 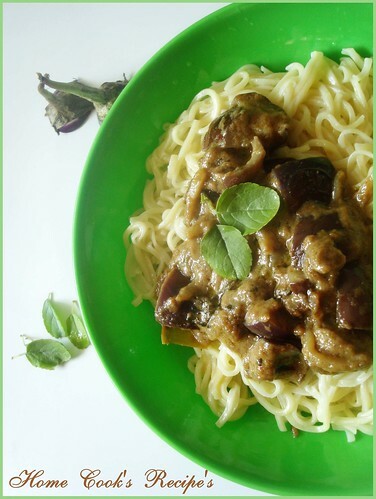 The eggplant, absorbed the gravy and tasted very good with the Noodle's. the guilty part is it had more oil content. but when we prepare at home, we can decide, how much oil should go in. Me and my son like it a lot, we actually licked the plate:) If you wonder, How to prepare Thai Green Curry, you can find it here at Jugalbandi. Now this Thai Special board's on to reach Dear Priya for her IAVW-Thai. Event started by Dear Vaishali. Looking Forward for your RCI-Pondicherry Entrie's and A.W.E.D - Japan Entrie's. When I first Googled for Lucknow Cuisine, I was impressed with the variety and richness of the cuisine, but sadly, there were not enough links for the recipe's to show up to you all. But this Roundup, which is full of goodness, will be a bliss to your eye's and very use full to try on the recipe's. I thank Lakshmi for giving me the chance to host the RCI-Lucknow and also My Heartfelt Thanks to each and every one, who have send me your entry with Love and Spirit. Iam glad, that this event made few to try their first hand on Roomali Roti's. I personally enjoyed hosting the event, When my inbox, says You have Got a Mail, and Sharing few extra words with the blogger's, that really bonded me with many blogger friend's. Thanks for the Happiness! Iam sorry, to post the roundup so late, as we went on a vaccation break and it took time for me to charge up here in my blog space. Now Let's move on to the Rich Roundup..
Hope You all enjoyed the roundup as i Did..Looking forward for your feedback's after trying these delish Dish's. Thank You Each and Every Participant, You all Made the Event Success.. If i have left out, any of your entrie's, Kindly Notify me, so that i can correct. Thank You! A Dream Came True! !